There's five stages catering to the Street Party revellers this year, not counting the Concert in the Gardens where yo can catch Primal Scream, Bombay Bicycle Club, Sons & Daughters and local act Matt Norris and the Moon. The West End Stage will be home to Wild Beasts and Friendly Fires, the latter bringing in the New Year. Over at the East End DJ Stage, Mark Ronson will usher in 2012, with support from Stu Todd and Jaymo & Andy George. Kassidy and The Vaccines play The Waverly Stage, with James Brown is Annie playing after midnight, while on the Scott Monument Stage, Peatbog Faeries will ring in the bells with support from Rura and Capercaillie. Finally, over at the Mound Party Stage, DJ The Great Calverto, Frisky & Mannish, The Cuban Brothers and The X-Factor's Jade Richards will perform throughout the night. Those kindly folks at Edinburgh Hogmanay are offering you ample chance to bring in the bells, whether on the streets or from the comfort of somewhere else. Better still, Citylink are providing late night bus services to Glasgow, Dundee, Perth and more. Call Citylink on 0871 266 3333 or citylink.co.uk for more. For those within Edinburgh, Lothian Buses are providing free services between 12.15am and 4am on the morning of 1 Jan.
Those looking to indulge in some home comforts while enjoying this year's mighty Hogmanay celebrations line-up can do just that, as this year's music events will be streamed live online, and feature tracks from headliners Primal Scream and Friendly Fires, as well as giving you a glimpse of the all-important fireworks. 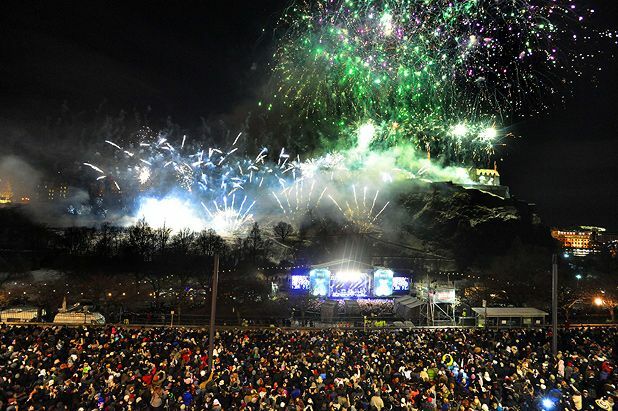 Register at edinburghshogmanay.com for one of the 20,000 free allocations and tune in to the one-hour-long programme, which starts at 11.30pm. Gone is the street party but in its place, there are family-friendly daytime events at George Square (31 Dec, George Square, 12pm, free). The ice rink will host the first Hogmanay Bonspiel Cup, where you can watch a curling competition or try it out for yourself. The square will also have food, drink, children's activities and trad tunes until 10pm. The Irn Bru Carnival (31 Dec, SECC, times vary, £12) is a Glasgow tradition, open until 9pm on New Year's eve and starting again at noon on 1 Jan. Just enough time to sleep off the worst of the hangover, no? Rides range from gentle dodgems and wee-one-friendly rides, to more stomach churning numbers for the braver ones amongst us. Tip: watch out for kids hocked up on sugar/gaggles of tracksuited teens. For an amusing start to 2012, you could try The Stand's Hogmanay Hootfest! (27–31 Dec, 9pm, £12–£22.50) featuring Sandy Nelson, Dana Alexander, Billy Kirkwood and Gavin Webster. And for something wholesome prior to your evening plans, the GFT are screening Bugsy Malone as part of their Take 2 matinee shows (31 Dec, 11.30am, £4). If traditional music is your thing, the City Halls is hosting the Raymond Gubbay Christmas Festival Hogmanay Gala (31 Dec, 7.30pm, £24–£36). Scottish favourites will be played alongside the likes of Rossini, Bizet and Debussy, all presented by Jamie MacDougall. Or, if you fancy hitting up Optimo, Numbers or another such club for something more electronic, check out our round-up of the best New Year's clubs. Detour definitely know how to party, so their Hogmanay gathering should be a riot. Live sets come from Kitty the Lion and Stanley Odd, plus a DJ set from the Detour team (chances of taps aff action, extremely likely). There are no pre-sales, so be sure to get down early. 31 Dec, The Old Bridge Inn, Aviemore, 9pm, £10. Allegedly Scotland's biggest free Hogmanay party, those with relatives up north can take a road trip and bring in the New Year with Craig Hill. Bands include locals Hooja, Wolfstone and Skerryvore. Tickets: no. Fireworks: yes. 31 Dec, Northern Meeting Park Arena, Inverness, 8pm, free. For a family-friendly start to January, you could take your mammy to the races. Part of Edinburgh's official Hogmanay but slightly further out of town, Musselburgh hosts a special New Year Sprint which involves people running instead of horses. 1 Jan, Musselburgh Racecourse, 10.45am, £19–39. The official Stirling celebrations, complete with fireworks, the Heart of Scotland choir, The Red Hot Chilli Pipers, Three Blind Wolves and Eddi Reader. Put on mittens to survive the likely breeze on the Esplanade and re-learn the words to 'Patience of Angels' in advance. 31 Dec, Stirling Castle, 9pm, £15–£20. A programme of family activities for the daytime and early evening of Hogmanay, including traditional music and children’s activities. Dive into 2018 with a dip off South Queensferry. Gather for the parade and watch as the swimmers freeze their proverbials off under the iconic Forth Rail Bridge. Are you brave enough to take on the Airmaxx 360 and Sticky Wall at Europe's biggest indoor carnival? If you don't have the stomach for thrill rides there's also traditional family rides like dodgems, waltzers and a helter skelter, with an inflatable play area for the wee ones. What could be a better way of seeing in 2012 and all the doom the year brings (the end of the world and all that, remember?) than being entertained by wonderful comedians such as Mark Nelson, Brendan Dempsey, Ro Campbell and host Jo Caulfield? Enjoy it while you can, this may be your last chance. Official Hogmanay celebrations on the Castle Esplanade. The Royal Scottish National Orchestra perform a concert of favorites with works by Mozart, Brahms and Verdi as well as Loch Lomond, Auld Lang Syne, Amazing Grace, Scotland the Brave and Highland Cathedral.